This guide will teach you how to buy BAT from square one (i.e., all you have is fiat money, no cryptos). It will also work for most other cryptocurrencies, but as I’m interested in BAT right now, I am going to write a quick foreword about it and then we’ll get right into the meat of the guide. We'll also be talking quite a bit about the Brave browser, which uses BAT extensively. There is a massive subset of people who are new to the crypto-space entirely but have only heard of Bitcoin. Then they go online, search around, and figure out there are actually many, many cryptocurrencies out there with many different use cases. In the case of the Basic Attention Token, the premise is simple: this token is a “unit of account” which will power a new blockchain-based system in which advertisers and publishers work together on the internet. The digital economy is largely powered by advertising. Unfortunately, Google has effectively monopolized online advertising via Google AdSense — and like most things Google touches, it’s all for the worse. As I’ve stated many times, I’m no fan of fascistic Big Tech companies like Google. Their stranglehold on the Internet gives them gatekeeping powers they simply should not have. Thus, I am automatically excited by any project which might reduce those powers. Enter BAT. Here is an ERC-20 token which is meant to revolutionize the world of advertisements and Internet browsing privacy. To talk about BAT, however, it would behoove us to first discuss the Brave browser. Because BAT is a token rather than a true cryptocurrency, the most important thing about it is the platform in which it is used, and in this case the platform is Brave. I’m not going to get into an extensive review of the Brave browser itself, since this topic is a little outside the scope of this article. All I will say is that I’ve used it and it seems like a nice, functional browser. It also supports most Chrome extensions natively! You should download it and try it out. If you use that link when you download it, they’ll even throw some BAT my way — sounds like a great way to do both of us a favor, right? On top of that, some new users receive a “Token Grant” which constitutes about five dollars’ worth of BAT to play around with. Maybe you’ll get lucky! Browse up to 3x faster. I’d believe it — there is far more tracking and ad bloat on the Internet than people realize. Get rid of that and pages will load faster! Block ads & trackers that follow you around. Self-explanatory. The Internet should not be Orwellian by default. As a result, this is a very good thing. Get rewarded for browsing. 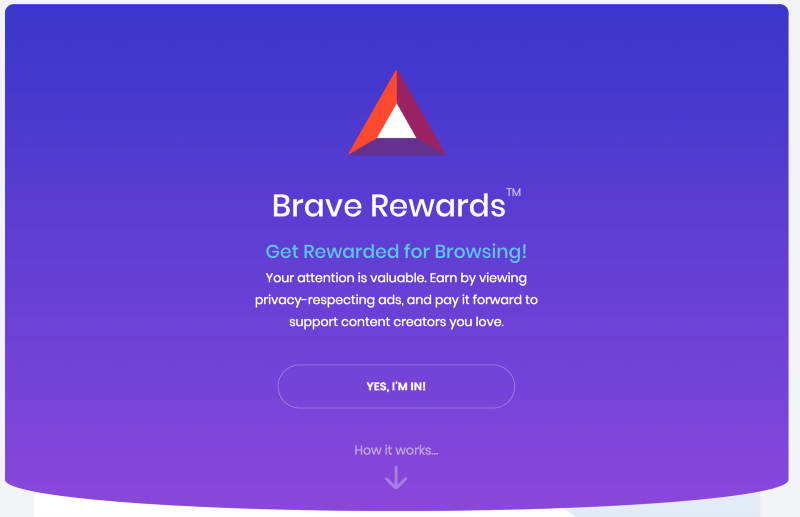 Brave allows you to — at your option — contribute to sites that you enjoy. This is all built into the browser. This third claim is where BAT comes in, and is the focus of this article. Just navigate to brave://rewards/ in your Brave browser to get here. The idea behind Brave rewards is that one can support sites that they enjoy in a variety of different ways. With any luck, this will help to dethrone fascistic, censorship-loving gatekeeping companies such as Patreon. After all, this is essentially Patreon’s business model except with added features. The ability to automatically “tip” sites based on the time spent on them is particularly ingenious. All of these donations, by the way, are anonymous. This is important! Financial privacy is increasingly crucial in a world where supporting anything remotely controversial can get you financially deplatformed or worse. With any ERC-20 token, the platform is what makes or breaks it. When evaluating whether it should be worth anything, there are a few questions you should ask yourself. Does the underlying idea seem like it is feasible and will interest people? Is the platform functional yet? Is anyone actually using it now? It’s early days for BAT — their website claims that “over 10,000 publishers and content creators have registered to receive Brave Rewards.” With that said, the idea seems sound, the platform is functional, and people are using it. So, how does it work? Later on, a more robust, multidirectional wallet will be implemented for those who choose to go through KYC procedures. While this might seem a little draconian, it is a smart move by Brave — they are correctly following regulations which keep BAT from being identified as a currency, security, or commodity. With that said, there are other options for safely holding BAT and I will discuss them later on in this article. In order to obtain BAT, you will have to purchase it on an exchange and transfer it into your Brave browser wallet from there. Later on, one will be able to purchase BAT with a credit card in the browser itself; this is a very good thing. This sort of all-in-one integration will be crucial for the success of this project. Okay, so this is actually only a few cents. Nevertheless, it’s still very interesting and cool that it’s possible for people to set up donations for sites even if the site owner hasn’t yet registered with Brave. If you are a content creator, it’s entirely possible that someone has set up BAT donations to you and you don’t even know it! If you want to find out, just visit Brave’s website for publishers. You’ll need to make an account there and link it to an Uphold wallet, but all in all the process was extremely straightforward and only took me about twenty minutes. Try it out! At the time of this writing, Bitcoin and especially altcoins remain in a bear market. Now more than ever it is crucial to think about which coins and tokens have a realistic shot at surviving into the next bull run. While I’m usually dubious about ERC-20 tokens, BAT strongly passes my litmus test for whether a utility token should be taken seriously. In addition to being a platform which is actually being used, Brave is a browser that is working to solve some of the worst problems on the contemporary Internet. My contention is that if Brave survives, BAT will survive. As always, I will end my thoughts on pricing with a comparison to another coin or token. At the time of this writing, Maker (MKR) has the highest market capitalization of any non-coin token and is ranked at #16 on coinmarketcap. If BAT were to have Maker’s current market capitalization of around $700,000, it would shoot from $0.19 per coin to $0.54 — almost three times its current value! This is certainly possible, considering that BAT’s ATH during the height of the 2018 cryptocurrency bull run was above that. Now that we’ve learned about BAT, let’s learn how to buy and hold it! Create and sign into a Coinbase account. I recommend Coinbasebecause they are the most straightforward exchange. Purchase some ETH. At the time of this writing, this currency transfers the fastest and cheapest out of anything Coinbaseoffers. Litecoin competes here, but will cause hiccups later in the process — more on that later. Create and sign in to a Binance account. I recommend Binancebecause they have been reliable and convenient for me and they offer many different lesser-known cryptocurrencies with trading pairs on both ETH and BTC. An added bonus is that you can withdraw up to 2 BTC/day worth of funds with no verification at all. Move your ETH to Binance. Once it has confirmed, you can now easily use the ETH/BAT trading pair to buy as much or as little Basic Attention Token as you want. More on trading pairs later. Send your coins from Binance to a safe BAT wallet for long term storage if you intend to hold for awhile. This is not strictly necessary but it is considered a safer option than keeping ANY coin on ANY exchange long term. I personally believe Coinomi to be the safest and most convenient wallet for many cryptocurrencies. Because BAT is an ERC-20 token, this step is a little more complicated than usual — I will give details on this later in the guide. The long story short is that it’s possible, with some effort, to use Coinomi, a Ledger Nano S, or a Trezor to store BAT. Once you are up and running there are a number of options when it comes to actually paying for coins via Coinbase. It is possible to link your bank account to Coinbase but actually transferring coins out of Coinbase will be impossible for a few days while the funds are clearing. This is obviously not ideal if you want to move quickly, as you would now have to wait several days to move your coins to an exchange where you can trade them for BAT (or any other coin). In my opinion if you intend to buy lesser-known coins like BAT, ETH is the best choice to buy here. Why? Well, with regards to LTC, the reason is clear: other exchanges like Binance offer direct trading pairs for BTC and ETH, but not LTC or any other currency. What this means is that you could directly exchange your ETH for BAT, or your BTC for BAT, but you’d have to perform another step if you wanted to trade your LTC for BAT (and that means more fees!). Obviously we don’t want to waste even one cent if we can avoid it, so LTC is out. Now is the time for you to make your Binance account. Follow the linkand create an account using a strong password (this should be different than the one you used for Coinbase!). There are other places where you may be able to buy BAT (Changelly, Kraken, EtherDelta, HitBTC, etc.). I cannot directly recommend most of these exchanges as I don’t have much experience with them at this point — however, I can say that I have used HitBTC and KuCoin and they have worked well for me. This guide focuses on Binance because my experience there has been 100% positive — I have transferred coins in and out of their system many times with no problems. Once you click Send, you will need to wait a little while. Without getting too technical about it, exchanges want to be as secure as possible. Thus, when you make a deposit, they wait for multiple “confirmations” from the network before allowing you access to your funds. You can view the progress in your Binance account by clicking Funds and then History. Do not be alarmed if nothing shows up at first! There are many reasons there might be a slight delay. In general you should see the transaction show up within a few minutes, with the current number of “confirmations” next to the number of required “confirmations” next to it. Be patient — your BAT is nearly in hand! Once you have the required number of confirmations, it’s time to trade your ETH to BAT. This is blessedly simple. In the front page of Binance, click “ETH Markets.” Search for “BAT/ETH” in this list, and click it. Now you are on the trading page. 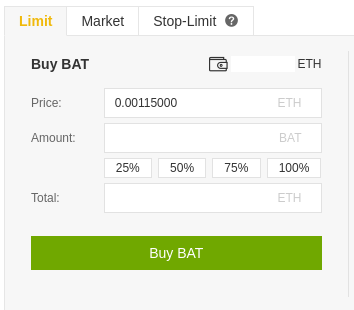 In the bottom left under “Buy BAT”, click “100%” below the “Amount” field. This indicates to Binance that you’d like to trade all of your ETH for a commensurate amount of BAT for no more than the price listed above. The price field is automatically listed based on the current market. If you like, you can change it to a different price, but like any market it’s not guaranteed that someone will buy at the price you’d like. Your order will remain open until it’s been fully filled or you cancel it. There are several options here such as Stop-Limit orders, etc., but this is outside the scope of this guide. In this case, you are simply placing a “Limit” order for some BAT. If you want to be done now, you can be — but there are more steps if you want to be security-conscious. You may want to check under the “Orders” and “Order History” tabs that the order went through — if you placed a Limit order at the default price, it probably did. Once you have your BAT in your Binance account, you can see them under “Funds” → “Deposits Withdrawals.” You can click “Hide 0 Balances” at the top to clean up the screen of coins you don’t own, and you can see an estimate of the overall converted BTC and USD value of your account at the top right. In Binance, go into the “Deposits & Withdrawals” tab, then click “Withdrawal” to the far right of the “BAT” row. By now it should be clear what you’re looking at — fields that let you input the address to send the coins to, and how many coins to send. For your convenience, there is a “Max” button to the right of the Amount field. Note that once you click “Submit,” you will need to use your two-factor authentication via Google Authenticator, an Android app. I recommend you do not use your actual day-to-day phone for this purpose. These days you can get an inexpensive Android phone for around 30 dollars — this is an investment worth making for security purposes. You can keep the battery removed from the phone when you’re not using it, and connect it to a network only for cryptocurrency purposes. As a bonus, if you’d like, you can use this phone for the Coinomi wallet. It is possible to get BAT working in Coinomi right now and the process is fairly straightforward. In my opinion this is the preferred method, especially if you’re willing to buy an Android phone solely for cryptocurrency use. However, if you’d prefer to use a desktop wallet, I have written an easy-to-follow comprehensive guide which walks you through how to use MetaMask and MyEtherWallet to store any ERC-20 token, including BAT. Of course, unlike many coins and tokens, BAT can already be used on an interesting platform. You’re probably going to want to send at least some of your BAT tokens to Brave so you can start spreading the love! Thankfully, this is very easy. Just navigate to “brave://rewards/” in your Brave browser and click “Add Funds” at the top right. From there you will see receiving addresses for a variety of cryptocurrencies, including Bitcoin, Ethereum, LTC, and of course BAT. That’s right: you can fund your Brave wallet with other coins too! Be advised that the information here only scratches the surface on the Basic Attention Token and cryptocurrencies in general. I recommend you read as much as possible. Cryptocurrencies are the future, and if you’re reading this guide you are already lightyears ahead of the curve.